Red, easily the most talked-about play of the fall, and possibly of this theater season, is wildly successful only in spite of itself. Made up of conversations between two characters who never leave their one room, Red is larger than the sum of its parts. A portrait of Mark Rothko in his later years, the play is notable for taking on the world of painting; Red is a work of art ruminating on another awork of art, while also ruminating on itself. But despite its complexity, Goodman Theatre’s production resists pretension, delivering a nicely balanced take on generational and creative struggles. The curtain opens onto Rothko’s New York City studio, the only room in which we see our characters. Rothko (Edward Gero) is hard at work when Ken (Patrick Andrews), an especially juvenile young painter, walks in, bringing with him theatrical tension. Rothko is hard at work on his series of murals for the Four Seasons restaurant, and Ken becomes his eager assistant for over two years. The characters are a perfect embodiment of the classic relationship between father and son, artist and apprentice, though this dynamic is, thankfully, turned on its head before the end of the play. As Ken matures, so does Andrews’ acting style, and the conceptual nature of the play is brought to the fore. The stage is a New York loft, fully transformed into Rothko’s studio. The play absorbs and accurately reflects Rothko’s paintings; the world of the stage is also fully inside this world, and isn’t formalist or stiff. Todd Rosenthal’s stage design, while original and engaging on its own, also highlights Red’s conceptual aims. Though the play includes a deep character study, the play’s setting, late 1950s New York, is, in some ways, a much larger character than either Rothko or his assistant. Rothko’s relationship with his artistic climate is mirrored in the actor’s relationship with the audience and the diegetic lighting provided by Rothko’s studio spotlights cooperates with the inclusion of the audience as one wall of the studio. Since Rothko’s works-in-progress are supposed to hang on the fourth wall of the stage, the actors are allowed to gaze into the audience under the guise of artistic pondering. At several points throughout the play, the spotlights are trained on Rothko, creating multiple silhouettes and suggesting his multifaceted nature and his tremendous influence on his surroundings. The play effectively represents Rothko’s painting by mirroring the concepts of his art; like abstract expressionism, Red is largely about movement and perception, despite the fact that the entire play takes place in a single, static setting. The immobility and security of the studio allow the paintings and their painters’ outbursts to have a greater effect; the drama lies in the colors and the shouts. Predictably, the relationship between the two becomes more intense, representing both the individual struggle an artist must go through to create himself and the passage from one generation of artists to the next. The early parallels also become messier as Ken’s past is revealed, and he eventually emerges from his mousy demeanor to triumph over Rothko and his overbearing opinions. However, the play isn’t about triumph but process. Just as Rothko’s vitality lies in the progression of his paintings, not in their completed state, Red must exist as a continuing ring of motion. 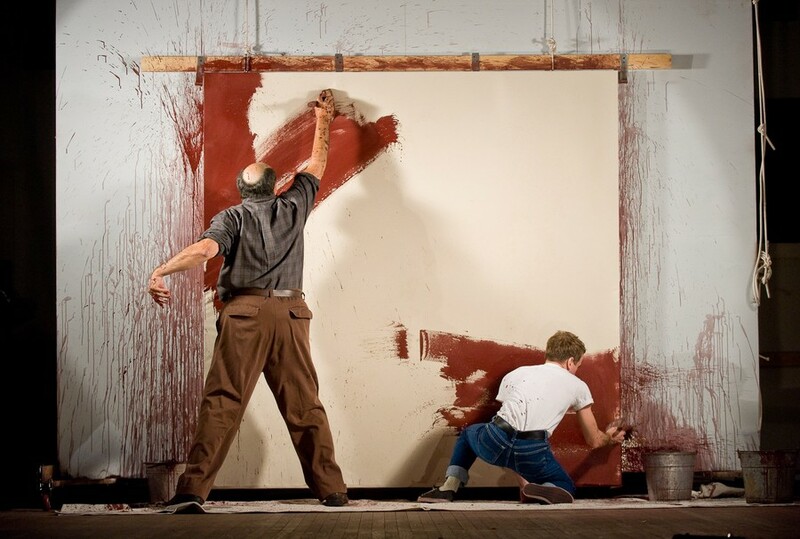 Like the swaths of red in Rothko’s paintings, the painters’ outbursts and breakdowns are what give the play life. Though the play ends with Rothko forcing Ken to leave the studio, because his life is “out there,” all of life is also inside the few minutes and words of this play.